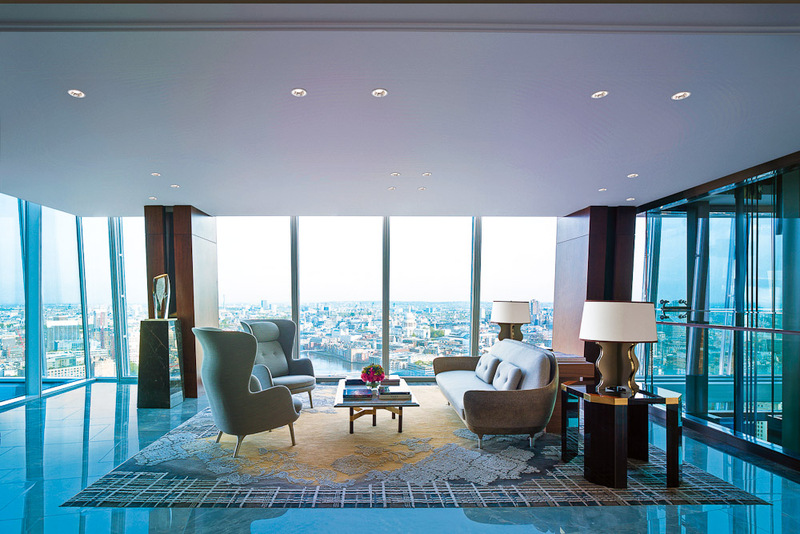 Quentin Long discovers that it’s all about the view in London’s tallest building, which houses one of the city’s newest – and most talked about – hotels. The Shangri-La Hotel, At The Shard has been in the pipeline for a very long time. That’s what happens when you house a five-star hotel in a mixed residential, office and hotel structure designed by one of the world’s most renowned architects, Renzo Piano; things never go according to plan. Nine months delayed, the hotel opened three weeks before I check in. It’s still not finished (several floors are not accessible and neither is the spa or pool) but it’s largely operational. Arriving by cab I’m whisked up a very fast elevator (35 floors in 28 seconds; it takes a while for your stomach to catch up) to a vista of London that I’ve never seen before. Most Londoners haven’t seen it before. In fact, anybody who’s been to London probably hasn’t seen it before. It’s jaw dropping. Situated on the Thames, it takes in the Gherkin, St Paul’s and Tower Bridge. As the lift doors close behind me, I find myself in a quiet and demure lobby, which allows the magnificent view to do all the wonderwork. The hotel, which occupies floors 34 to 52 of this magnificent building, was scathingly reviewed by London’s Telegraph for its ‘vile carpets’ and interiors where the no-name designers were ‘not trying very hard’. But I must declare au contraire to my posh friends at the Telegraph. It is a highly functional, plush environment where the views are allowed their natural status as the showstopper. Too much design here would have provided distracting competition. Perhaps the Telegraph is averse to “no-name designers”. When you think about Shangri-La hotels, there’s some inconsistency across the portfolio but there are two things that are consistent: you’ll get gold shimmery textiles and a Chinese essence, often through the ubiquitous brown marble seen in every one of the Hong Kong-based chain’s properties. And so it is in my room. 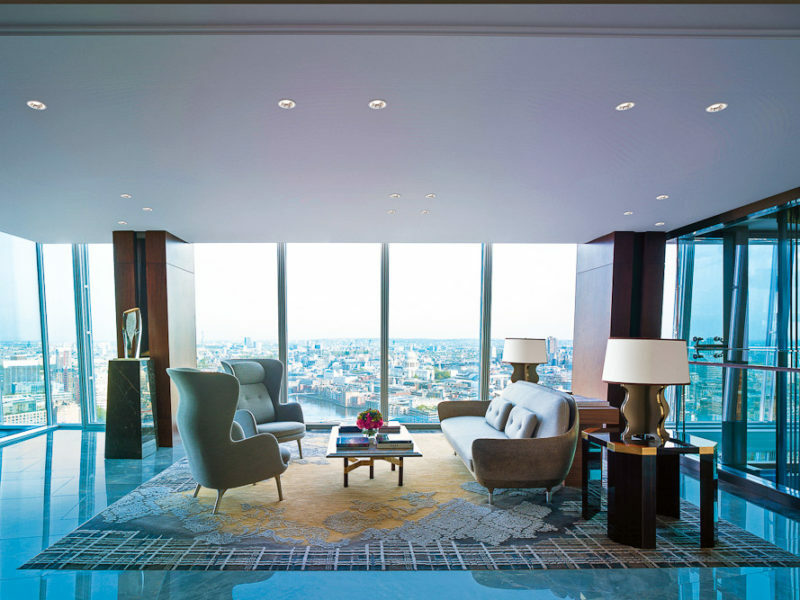 Located on the 49th floor, my room is huge by London standards. I’m blown away again by that view. I’m facing west and spy the London Eye, Big Ben, the river. It really is London in a whole new light. And then my welcome tea arrives in its own cute tea-cosy reminiscent of a ladies’ hat bag. All the signature design elements of the Hong Kong based Shangri La Hotel Group are present – gold and silver fabrics with brown marble – with the added dose of a room with a view. The service touches add the X-factor that shards of glass, marble and furnishings can’t. After some negotiation with the concierge I manage to make a reservation for dinner at Ting on the lobby level. Frustratingly, I couldn’t get into Gong, the bar at the top of the building on Level 52, until well after sunset at 10:30pm. In fact, the whole time I’m in residence almost everything is booked out. Lesson learnt: book well ahead. But dinner is a highlight; again it is due to the magical combination of view and milieu. As the sun sets and bathes the train lines and south-east London in golden light, I feast on seared tuna with radishes and ouzo followed by John Dory with sweet potato and wild mushrooms. Executive chef and Shangri-La veteran Emil Minev is a relative no-name too, although his El Bulli and Alain Ducasse-pedigree show on the plate, with the food worthy of celebration. There are some weaknesses, and the carpet is not really one of them. (The hibiscus-and-frangipani-flower design may not be everyone’s taste but it is by no means offensive or vile.) Piano’s Shard is meant to reflect the sun, to gleam like a shard of glass rising to the sky. But the glass is unfortunately not reflective enough. Not exactly ideal for building observers as London and sunlight are not the best of friends anyway, and a slight problem for hotel guests. The lack of reflection allows views into adjacent rooms. From my bathroom (bath tub to be exact) I spy the bed, TV, fruit platter and lounge of the room next door. This necessitates drawing the curtains to enjoy the bath. And the electronically controlled blinds are not separated, so the curtain comes down on all the windows, and all the view. No biggie but at this prestigious hotel standard (and rate) it should be faultless. The service at a new hotel can be hit and miss and while the Shangri-La Hotel, At The Shard hits a lot more than it misses, there are small hiccups. When I appear for my late lunch, there is confusion as to which menu is available and where to seat me as the high tea crowd is about to descend en masse. I am eventually seated but the wait staff are preoccupied with the high tea customers rather than the strange jetlagged man with a big camera sitting on his own. This hesitancy and confusion follows me as I am often referred to as Mr Myers when giving my room number. Apparently the computer system has crashed giving staff the wrong name. The choice of tables in the restaurants and bars is also problematic. They mark very easily with any moisture and are impossible to clean. At lunch I request the table be wiped down twice and then use my napkin as a tablecloth to feel comfortable on what would otherwise be categorised as a ‘dirty’ table. I am not OCD about these things, but this should not be a problem at this level of hospitality. The lobby area, lounge and restaurant all flow into one space so really there is no one glorious area in which to enjoy the vista, while the best views are usurped by the reception desk. Even more baffling, the toilets on this lobby level take out one of the most sought after perspectives, the London Eye and the parliament buildings, while the restaurant and lounge face Tower Bridge and the railways lines. But that’s why you book a room. Waking up in the morning, hitting the button and raising the blinds, I am bathed in sunlight… and it feels like a view from heaven. Location: 8/10 – Near London Bridge Tube Station and the revitalised Southbank. Style/character: 8/10 – It’s probably lacking a little bit of smarts. Service: 7.5/10 – A bit tentative at the moment as it’s still bedding in. Rooms: 8.5/10 – Fantastic and true to its heritage by being obviously Eastern. Food and drink: 9/10 – Remember to make a booking so you don’t miss out. Value for money: 9.5/10 – It is worth seeing once in your life. Cost: Quentin paid $AU672 for a Superior Room.